Reusable Pallet Tracking System to Maximise Asset Lifecycle, Increase Productivity, Save Money and Reduce Your Carbon Footprint. Millions of reusable wooden and plastic Pallets are lost and stolen every year at great cost to businesses, consumers, the economy and the environment. NFC Group designs and makes customised RFID, IoT and GPS Pallet tracking, monitoring and recovery solutions, powered by real time data fed back over our Orion Data Network. These Pallet solutions give you total visibility over your assets and identify weak spots and bottlenecks in your supply chain, allowing you to maximise the Pallet lifecycle. Many different occurrences in the supply chain can lead to the loss of reusable pallets. These include accidental misdirection to the wrong supplier or customer, accidental or deliberate failure to return the pallets by the receiver, stock-holding causing a bottleneck in the supply chain, theft by individuals and organised crime gangs, and accidental disposal. Globalisation and multiple modes of transport across land sea and air is also a major contributor to pallet loss, as is a failure to use optimised routes or rotate routes to ensure there is regularly space on the vehicle at all empty pallet pickup points. The cost of a new pallet can be as high as £8-10, but it only costs a fraction of this to repair them and reuse them in the supply chain. In addition to the loss and the repurchase costs of the pallets themselves, other losses include the time and labour spent looking for the pallets and delay in other shipments being sent out due to a lack of containers to carry them in transit. All over the world, Pallets made from wood, high density polyethylene and polypropylene, and their valuable cargo, are being lost and stolen at an alarming rate. In the USA the loss of these reusable assets is costing retailers and consumer packaged goods businesses around $500 million per annum. 30% of all pallets in the US bakery industry go missing each year and in the dairy industry around 25million pallets are lost, predominantly to theft. Of course, the cost is passed onto the consumer and goods prices soar to cover the losses. In the UK a recent and more quirky issue that has come to light is the trend for people to take pallets from supermarkets and local councils and use them to fuel their village bonfires on Guy Fawkes night. This has become so prevalent across the UK, that the knock-on effects of this one night has been costing the UK economy millions in recent years. Failure to reuse pallets is not just an economic issue it also has a negative impact on the environment. NFC Group creates solutions harnessing RFID, IoT and GPS technologies so you can easily track, monitor and recover your pallets for reuse, saving money, boosting productivity and reducing your carbon footprint. 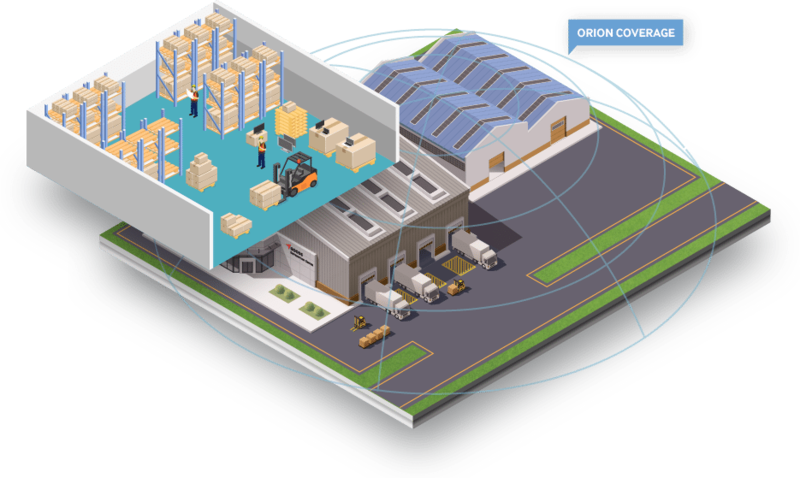 Our Orion Pallet Tracking Solutions combine a system of tags and gateways with RFID and GPS technologies and customisable IoT-connected sensors. The system can monitor a wide range of conditions depending on what is most important to you and your business. For example, you can determine the location of your Pallets and alerted as to temperature, tampering, shock, tilt, moisture, weight and other factors. The Pallet data is sent over the Orion network every 2 minutes when the Pallets are stationary and every 15 seconds when they are in transit. If you want to ensure that your Pallets stay within certain geographical areas, you can use the geofencing capability and receive instant emergency alerts to your mobile if the Pallets go outside of the desired zone. Our Pallet solutions also operate in beacon mode with a handheld active RFID reader to uncover the exact location of lost or stolen Pallets and allow retrieval. The accurate real-time business intelligence that Orion provides allows you to make intelligent, data and insights-driven business decisions, benefit from high levels of automation, eliminate bottlenecks and accurately predict your Pallet repair and repurchase schedules. With Orion you can achieve the maximum lifecycle of your Pallets and benefit from reduced insurance premiums and a reduced carbon footprint. We train our customers and local police to use the Orion hand-held RFID readers in beacon mode to pinpoint the exact location of lost and stolen Pallets and other assets. Orion solutions lead you straight to your stolen Pallets, so you can recover these assets and the goods they contain, increasing the chance of securing an arrest and conviction. Pallets are valuable assets that should not be overlooked. With NFC Group’s Orion Pallet solutions, you can improve your demand planning, manage your Pallet inventory efficiently, save resources with predictive scheduling, raise productivity levels, deter and catch thieves and take more efficient routes for picking up empty Pallets and delivering full Pallets. A streamlined supply chain and excellent logistics help you offer your B2B and consumer customers, partners and staff a better experience with your business. Orion operates over a broadcast network rather than a control channel network, so you can scale up the system as your business grows maintaining the same level of data accuracy and speed. The tags and gateways communicate by RSSI (Received Signal Strength Information) so every transmission is heard by all gateways within range for highly accurate results. The Orion Data Network is highly secure and there are various additional security measures that we can use including for example hiding the identity of tags attached to the Pallets, to further reduce business risk. As your business grows and the number of Pallets and other assets in your supply chain increase, it is very easy to simply add more tags and gateways to expand your network. As you deploy more tags and gateways and monitor other assets, in addition to Pallets, across your various business sites or your suppliers’ sites, your asset management becomes more integrated and efficient, giving you greater time and cost benefits. Orion’s broadcast based system means the tags attached to your Pallets and other assets have a longer and more predictable battery life. The problem with other Pallet tracking solutions on the market, which often use a control channel system, is that the tags must search for available control channels in order to operate. This can drain the battery life at the device end and cause it to vary by up to 300%. Orion allows you to accurately predict battery life and paving the way for more accurate predictive maintenance, repurchase and retirement. 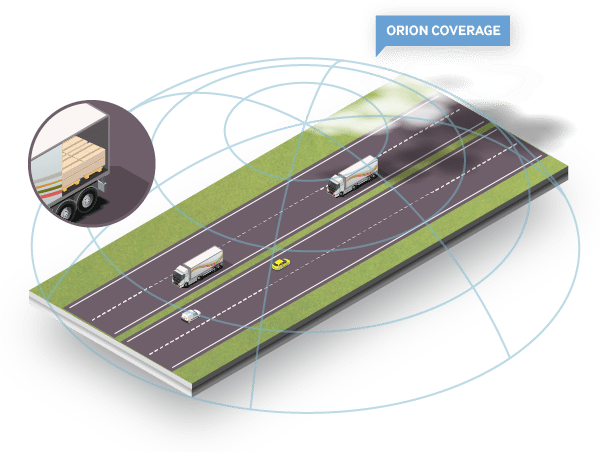 NFC Group’s Orion asset tracking, monitoring and recovery solutions, are simple and fast to install and implement and can be integrated with your existing asset management and security systems. Orion automates your asset management throughout your supply chain and gives you better control with 360 degree visibility, greater flexibility and infinite scalability. You can predefine the type of business intelligence you want to receive about your Pallets to get the right information to make better business decisions. Sharing this data throughout your business and with third-party partners enables you to streamline your while supply chain and quickly see a great return on your investment.